Glass is a common practice, and many communities include glass bottle and container collection in curbside collection programs. (.) Recycled glass is sought by the glass packaging industry as it requires less energy to process, and therefore is more cost effective than virgin glass. However, when the glass is commingled with other materials in the recycling process, broken glass shards can result in contamination and safety concerns. Another consideration is that fewer and fewer glass containers are being purchased as consumers shift to plastic. As a result of such trends, some communities, including my local city, have phased out glass recycling at curbside. Even as some cities curtail curbside glass recycling, however, alternative recycling options may be made available for this material. When it comes to the importance of recycling glass, here are four compelling points to consider, offed by . Recycled glass can be used over and over: Very little waste is generated in the glass recycling and manufacturing process. Recycled glass can be used to produce the same product over and over. Lower carbon footprint: Glass packaging's carbon footprint can be dramatically reduced through the use of recycled glass. For every kg of recycled glass displaces the need to extract 1.2 kg of virgin raw materials. Every 10 percent of recycled glass or cullet used in production results in an approximate 5 percent reduction in carbon emissions and energy savings of about 3 percent. Efficiency improvements: Improvements are helping to improve the recovery and recycling of glass containers. For example, Pace Glass has developed ways to recycle glass that most other cannot such as colored or dirty glass. Another important trend has been the lightweighting of glass packaging. Such innovations have helped to divert glass from landfills (in the case of improved recovery of recycled glass) while reducing energy usage and global warming potential. Superior product preservation. Pace Glass notes that no other packaging material does a better job in preserving food and preventing penetration by contaminants. Glass containers can be easily resealed to help prolong freshness. "Cullet" is the industry term for furnace-ready recycled glass, material which is free of contaminants such as ceramics, metals, stones, or gravel, etc. Bottles and jars made from glass are 100 percent recyclable and can be recycled endlessly without loss of quality. Glass containers for food and beverages are totally recyclable. Other glass products such as , ovenware, Pyrex, crystal, etc. are manufactured differently. If such materials find their way into the glass container manufacturing process, they can result in production problems and defective containers. An estimated 80 percent of recovered glass containers are made into new glass bottles, and it can happen quickly. A glass container can go from a recycling bin to a store shelf in as little as 30 days. Glass container manufacturers hope to achieve 50 percent recycled content in the manufacture of new glass bottles. This achievement would save enough energy to power 21,978 homes for one year and while removing over 181 tons of waste from landfills on a monthly basis. According to the Glass Packaging Institute, containers averaged 33% recycled content in 2013. Energy costs drop about 2-3 percent for every 10 percent of cullet used in the manufacturing process. For every six tons of recycled container glass employed in the production process, one ton of carbon dioxide creation is avoided. Approximately 44 glass manufacturing plants operate in 21 states. According to the , 63 glass beneficiating facilities across the country. At these glass processing plants, recycled glass is cleaned and sorted, prior to being resold to glass container manufacturing companies for remelting into new food and beverage containers. On average, a typical glass processing facility can handle 20 tons of color-sorted glass per hour. Over 41% of beer and soft drink bottles were recovered for recycling in 2013, according to the US EPA, along with 34.5% of wine and spirits bottles and 15% of other glass jars. Overall, 34% of glass containers were recycled. States with beverage return deposit legislation averaged a 63% return rate for glass beverage containers versus 24% in non-bottle bill states. 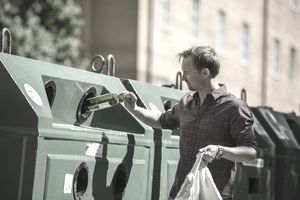 States using bottle bill programs, in conjunction with single stream (one-bin) programs, can increase the beverage container recycling rate by 11%, and the . For more information on glass recycling, check out my article on glass recycling facts and figures, as well as my coverage of the benefits of state bottle bills. Beverage bottle recycling bills are critical in the design of recycling programs which incentivize the diversion of beverage containers from landfills, including glass bottles.